This whimsical doodle collection includes 12 Prim Annies, one for each month of the year, in a setting with other images that are associated with that month. These pattern drawings are also filled with wonderful Prim Pals like sheep, crows, rabbits, kitties, dogs, squirrels, birds, bees, snowmen, and more. You may use the doodles as a pattern for stitchery, applique, tole painting, needlepunch, rug hooking ... whatever craft you enjoy! Your designs will be sent to you as a PDF File within 24 hours as soon as payment is recieved. Enjoy! I invite you to enlarge the picture of this great winter stitchery to see the wonderful details of the childlike sleigh and the Prim Snowman with the crow on his top hat and his fun checkered vest. Included in the directions is a description of a great pattern transfer technique using your Scanner and a PC... guaranteed to give you a perfect pattern outline each time - without having to hold the pattern up to a window for tracing! It's an easy way also for you to tranfer your pattern to homespun fabric for a really prim rustic look for your finished item. You may choose to frame this 8 1/2 X 11 stitchery or make it into a pillow top as shown in the picture. Your Line Drawing and Word Document with the Pattern Directions will come to you in a Zip File. If you prefer, the pattern may be sent to you by First Class Mail for an additional $1.50. With this pattern, you will be able to craft three dimensional Wool Felt Pears, measuring approximately 10",8",and 7", and the Pears will be free standing for any shelf or table in your home. If you enlarge the picture, you will see that the edges of the pear seams have been stitched with a decorative scallop trim on the outside, much like a rag quilt is done. The leaves have wire centers, so that you may position them however you like. Included in the pattern are full size templates for each Pear and tips, and techniques for stitching the Pears are included with the directions. This pattern is available as instant download as a ZIP File, or, for an additional postage charge, it will be sent to you by First Class Mail. Enjoy! 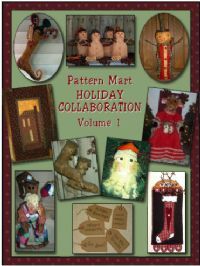 I am proud to be a part of an exciting E-Pattern Collaboration with some very talented crafters from PatternMart. My pattern is the Wool Applique Homespun Stocking WallHanging that is three dimensional so that you may decorate the wallhanging with your own additional personal touch by placing twigs and florals into the stocking. You will receive all 10 of these patterns in this one collaborative e-book. Ten of the very talented designers of Pattern Mart have come together to bring you this wonderful collection! You'll receive a pattern from Tennessee Ridge Primitives, Moonchilds Primitives, Blackberry Patchworks, EweNme Printables, Dirty Crow Inn, Seneca Pond Crafts, Threadbare Primitives, Sew Cute Dolls, Homestead Greeters, and Mamaws Creations. So grab your copy and enjoy! To purchase make payment through Paypal (DO NOT USE e-checks that are not instant transfers from your bank account) and on the last page of Paypal where it says "You've Made A Payment", on the bottom right click the button that says "You Must Click Here To Download". A blank page will come up. Don't back out or X out of that page. In a few moments a download box will come up and start downloading your pattern. If you have any problems please e-mail: admin@patternmart.com with a copy of your paypal receipt and we will be happy to e-mail the e-pattern book to you. This wonderful Valentine/Everyday pattern is available as an e-mail PDF file for which you will need Adobe Acrobat Reader to open the pattern and then print it yourself. The pattern will be e-mailed to you within 24 hours. Using Wool Felt, traditional Blanket Stitching as used in making a Penny Rug, Vintage Embellishments, and a purchased Electric Candle Welcome Light, you can create this unique 12" Heart Make-Do Lamp yourself. You will get full sized pattern templates as well as directions with hints for techniques that will help you to craft smarter, not harder. Create a family heirloom today! You may choose to have this pattern mailed to you for an additional charge of $1.50.